One of my favorite ways to continue to grow professionally and personally is by listening to podcasts. My phone is always loaded with a variety of podcasts to listen to if I’m out for a walk, traveling, or just cleaning the house. In addition to listening, I love to share with others by co-hosting and joining in on podcasts. The PrincipalPLN Podcast is a weekly podcast focused on providing current and aspiring school leaders with advice, support, and ideas. I am fortunate to join Spike Cook and Theresa Stager each week to record this podcast, which can be downloaded from iTunes, SoundCloud or viewed on our Youtube Clips at PrincpalPLN.com (where you can also find weekly show notes). 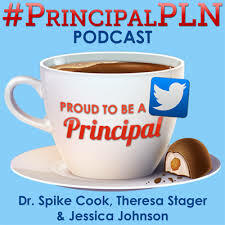 Many of us (including our listeners) enjoy continuing the discussions for learning with our PLN by using the hashtag #principalpln on Twitter or discussing leadership topics in the PrincipalPLN Voxer group. If you’re interested in joining this Voxer group or want to know more about how to use Voxer, please feel free to contact me at jessica@principalj.net. BAM Radio Network: Talking about Too Little Time? EdAdmin Show #2 – What role does Social Media play in school leadership? TeacherCast Podcast #11 Administrator 2.0 along with Patrick Larkin talking about a variety of tech topics from an admin standpoint. Techlandia Podcast: “Steak and Eggs” Not sure why they called it this, but this was a podcast with a few other administrators.